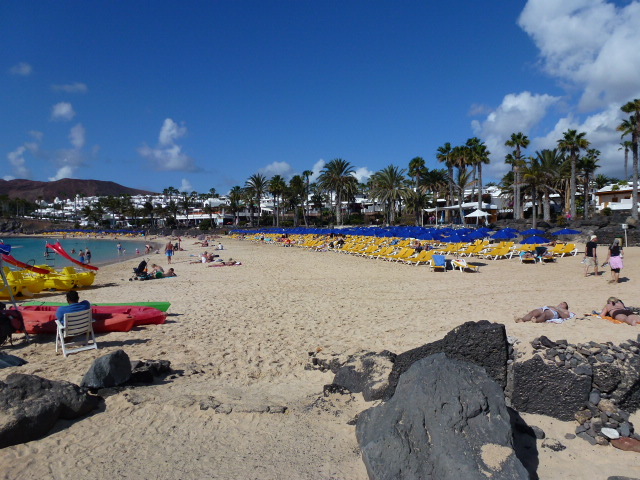 Playa Blanca is the sunniest and most southerly resort in Lanzarote and boasts many fine golden sandy beaches with placid waters. The beautiful promenade is bordered by picturesque restaurants and bars and stretches from the new Marina Rubicon towards the old fishing harbour of Playa Blanca then on to the Pechiguera Lighthouse. The pedestrianised village has three small supermarkets, an excellent selection of shops and restaurants as well as the essentials such as banks, bureau de changes, and car hire offices. An open air market is held every Saturday morning at the Marina Rubicon. The beaches of Punta de Papagayo have natural white sands and are composed of several small bays and coves with crystal clear waters. Regular boat trips run from the harbour, where you will also find ferries to the island of Fuerteventura. The nearest beach to Casa Linden, Playa Flamingo, one of the prettiest beaches on the island, is just a short stroll away. It has a range of great restaurants and shops. Natura Beach is also nearby and has some very good restaurants, cafes and bars, as well as a Dive Centre.